The Rudder. I constructed the rudder first. 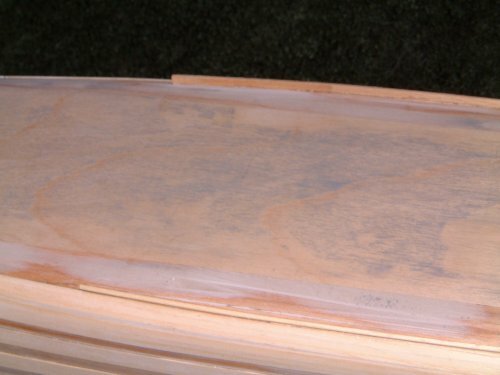 The photos show how I sanded the rear edge of the rudder. The bars have also been tapered slightly in width, and then thinned down a bit after I glued them in place. I used super glue to glue them. The top of the rudder has been sanded to a round section. The rudder took quite a long time to complete - a couple of evening work. This is the hole for the rudder. This proved to be quite tricky as it is very close to the rudder carrier. 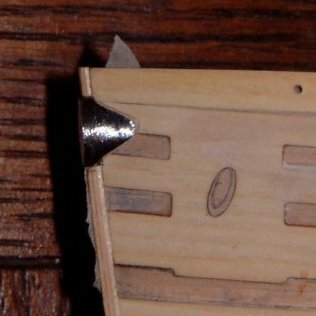 I drilled it out with a 3mm drill as close as I could get it, then eased the hole out to the correct size and position with a round grinding bit. You can see a couple of marks in the veneer just aft of the hole where the grinding bit slipped. Nothing a bit of filler won't fix. The Centre Stern Tube. The first of the stern tubes has now been fixed. 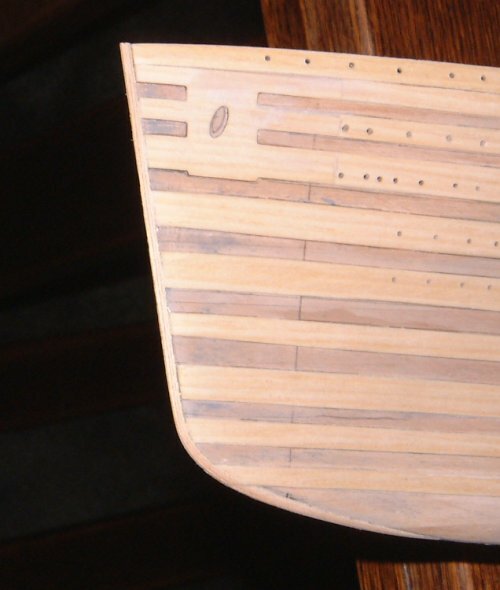 Measure this carefully, and double check to make sure that the centre of the stern tube is half way between the top and bottom of the cut-out for the prop. I found that the 16mm quoted in the instructions was correct. The part needed the inside filed out so it would fit nicely, then it was glued in place with Araldite. Superglue doesn't work very well., and white glue won't touch metal. You can also see where I've filled in the space between the 2 second planks ready to fit the port stern tube. I strayed form the instructions here and used an offcut from the second layer of planking rather than using the wood provided this week. The port stern tube. 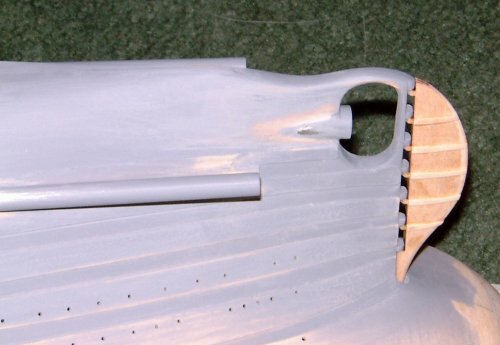 Firstly, it took a lot of shaping to get the metal part to sit smoothly against the hull. Just hard work with a file and keep checking. Now for a quick tip on positioning this part. The 16mm from the bottom of the prop guard is about right, but a fairly useless measurement. Sit the model on a flat surface, then measure from the centre of the center stern tube to the table that the model is standing on. Now cut a block of wood the same height as this measurement. You can now use this block to mark the position of the front of the tube, and by holding the tube in place against the block and the hull, you can mark the position of the back. The aft measurement is a bit tricky and much easier with a second pair of hands. You'll see some brass pegs in the stern tube. These are there to reinforce the join. Find some brass rod about 1.5mm thick, and find a drill the same size. The actual size isn't that important - anything between 1 and 2mm will do, but the drill should match the size of the rod. 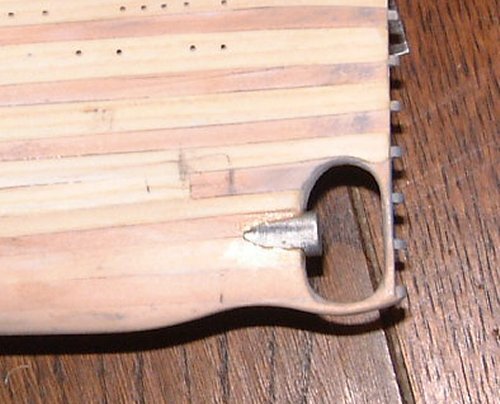 Drill three holes in the metal part, cut three pegs and fix them with superglue. Now mark the position of the pegs on the hull and drill 3 more holes. Finally, glue the tube in place with Araldite or something similar. I used the slow setting stuff which works really well. The edges will need tidying up with filler. The bow - My bow sanded down so that the front edge was slightly wider than 2mm, so I used 3 strips of wood rather than 2. This will give me a nice shape. The wood was a little narrow, so it's filler to the rescue again. It may seem that I'm using a lot of filler - well, I am. The model is going to be painted, so it won't be seen, and why make life difficult for yourself trying to get every part to fit perfectly. It takes less time to add a bit of filler than it does to get every part to fit perfectly, and if filler is carefully applied and sanded with very fine sandpaper, it will not show underneath the paint. The casting for the bow proved to be a bit tricky to fit. I thought it was going to be way oversized and unusable, but actually it isn't too bad. 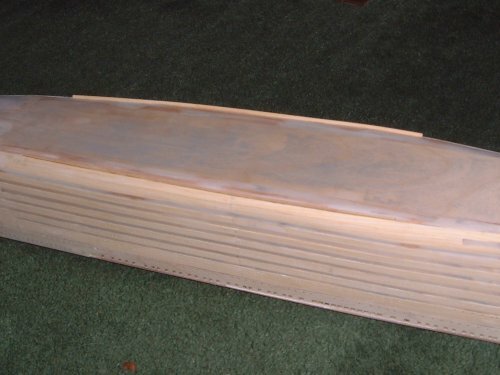 It fits quite well if you cut out the second layer of planking as per the photo. The inside needed a little filing. Then I filed the outside to get a good finish and fit. The wood supplied with the kit is 2x2mm. 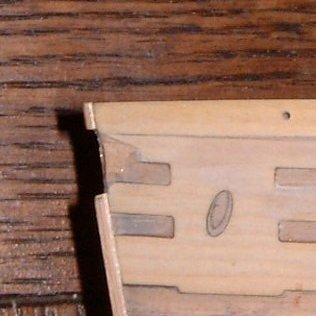 However, as bilge keels are usually thin strips rather than square I decided to use some 1.5 x 3mm wood strips that I had. Firstly I sanded them smooth, then glued them in place with Superglue. It all went surprisingly easy. Fitting the rudder. This was quite straight forward. Just scrape off any paint and then glue it in place with superglue. You'll also note the grey primer that I used as an indicator coat to see where the defects were in the filler. The bulwarks front and aft, port and stbd where the scuppers are were also filled and sanded. No pictures of these, but it was quite straight forward. This completes week 38 - There was a lot of work considering we only received 4 castings and a few strips of wood. If using the cardboard cabin walls as supplied by Hachette cover them in transparent sticky back plastic before cutting them out of the card,this stops them getting dirty and discoloured as the build continues and yes I did watch Blue Peter.